Every day we bring you a fresh instalment of our Ischia blog, Good Morning Ischia! Here you can see the entry for Sunday 16th February 2014. This morning, along with every other morning over the last week has brought the wonderful sight of clear skies and bright sunshine as the island enjoys an unexpected spell of warm weather. We're still officially in winter but today's temperatures make a mockery of that with today's high expected to reach up to a whopping 19° Celsius (65° Fahrenheit) and drop no lower than 14°C (57°F). I say the weather is unexpected because we've still got more than a month left of winter but the daffodils are already out in the garden and spring is upon us, even if it's not official at this point in time. As you may have noticed, the daily blog has been absent over the last week but not without good reason. We're currently in the middle of a big upgrade to the site which we're hoping to complete by the end of February. The upgrade is necessary to allow us to keep improving the site and whilst we're doing that, the blog will be written just once a week, on a Sunday. As soon as the upgrade is finished then the blog will return to its usual daily position. The blog photo will continue to be published on our facebook page for the time being but as soon as the upgraded site is up and running it will return to its position on the blog and front page. Today's photo comes from the beautiful Chiaia di Rose beach in Sant'Angelo (not to be confused with Chiaia beach in Forio). The fairly small beach is popular during the warmer months (I suppose we have to add February to that list now!) and forms the area that links the mainland to the huge rock that sits in Sant'Angelo's bay. The beach is double-sided but most people tend to use the right hand side as it gets more sunshine and is also away from the boats in the little harbour. This more popular side isn't a free beach but you are provided with a sunbed and parasol for your trouble. 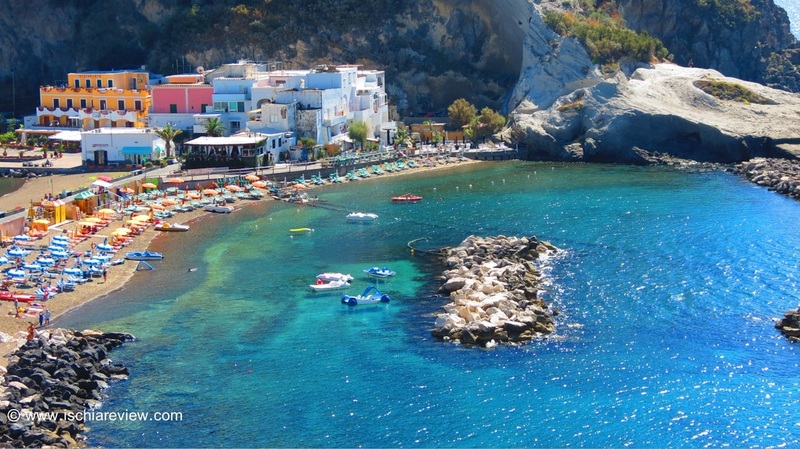 We've got a big section on the website that describes all of Ischia's best beaches with photos, directions and other useful information so have a browse through those if you're planning a visit and trying to work out the best place on the island for you to stay. If you've had a look through the pages on the site and are still not sure about something you can always drop us a line and we'll be very happy to answer any questions you may have about the island so don't be afraid to ask. Ok that's all for today, the next blog update will be next Sunday so I wish you all a fabulous week wherever you may be.